It has been a while since I’ve posted one of these. “Before The Law” comprises part of the penultimate chapter of The Trial, though an extant form was published during Kafka’s lifetime. It is said that Kafka used to laugh hysterically when reading The Trial to his friends, and this makes me wonder whether “Before The Law” inspired the great Seinfeld episode “The Chinese Restaurant.” In both cases, for example, the protagonists are being denied access to a place they are completely free not to attempt to enter; when they inquire as to whether it is possible to enter, Kafka’s gatekeeper replies “It is possible [. 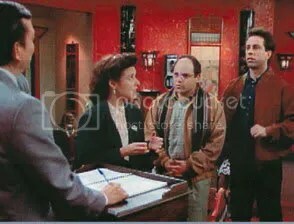 . .] but not now,” while Seinfeld‘s maître d’ repeatedly assures them they will be waiting “5, 10 minutes,” regardless of how much time has actually passed; and both protagonists try unsuccessfully to bribe the gatekeeper/maître d’, though their gifts are accepted. Read the story, watch “The Chinese Restaurant” (if you have it on DVD/VHS) and see what you think. The short story is a brilliant allegory within a novel that is itself a brilliant allegory. I can’t recall the Seinfeld episode in question, but I remember thinking that Seinfeld recapitulated some classic absurdist themes (Beckett and Kafka come to mind) within the sitcom format. Incidentally, do you have any reference for Kafka laughing during this story? I’d be interested to read the context. I can’t recall exactly where I learned about this . . . quite a few years years back I read Deleuze and Guattari’s book on Kafka, and they may have mentioned it. This site refers to it also. Thanks, J. I knew I’d read about that somewhere. Max Brod, Kafka’s literary executor, actually stated this. (This being Kafka’s taking humour in his own writing when read aloud.) Vintage Books Edition, February 1969. Brod was actually present for most if not all of these readings, which by his admittance was the majority of ‘The Trial’ among many others of Kafka’s “scribblings.” You’ll understand that last quotation if you find that edition or read more about Kafka. Can someone please help me understand what it means??? like the meanings and what the law actually means…. thankyou.